I love longganisa specially the encased version. 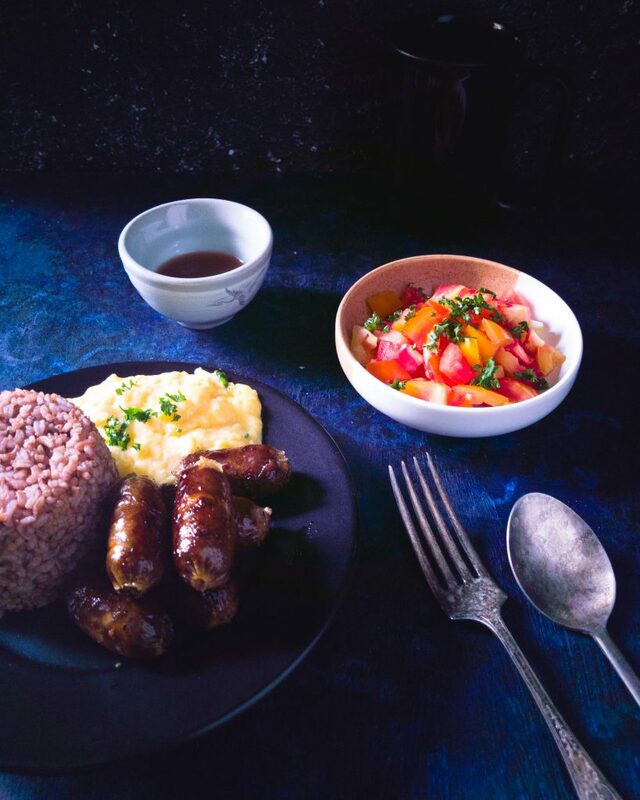 Longganisa is a Filipino sausage usually made of ground pork. Different condiments and spices are added to flavor the meat. Each regions in the Philippines have their own version of longganisa. Some are garlicky, sweet or a combination of both. My favorite version of longganisa is the the Vigan Longganisa. It is small but the flavor is so savory and garlicky. This version of longganisa is probably the Longganisa de Recado. 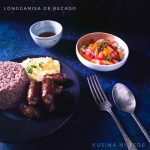 Typically, there are two types of longganisa, namely, longganisa de recado and longganisa de hamonado. Longganisa de recado is the garlicky version of longganisa. The longganisa de hamonado on the other hand is the sweet version of longganisa. Some locals prepare their longganisa by manually mincing the pork and dicing the pork fat to give it an added texture. However, since I’m too lazy to mince the pork, I decided to just buy some ground pork. Yup! That includes the fat. I find cubed fat in longganisa to be annoying and bothering. It’s just that I really don’t like it’s texture. This longganisa is so easy to prepare. Simply mixed everything and refrigerate to develop its flavor before putting into the dried hog casing. You can use fresh hog casing but I find the dried version more convenient to store and probably has longer shelf life. I prepared this several weeks ago and simply stored it in the freezer. You can also check out the Homemade Longganisa (Filipino Sausage) for the skinless version of longganisa. Some use 25:75 ratio of fat to meat but I prefer the 30:70 ratio. It gives the right amount of fat and flavor to the longganisa. You probably don’t need any cooking oil when cooking longganisa. Simply add a quarter cup of water into a pan with the longganisa and let it simmer until the water dries out. You’ll see the fat oozing out form the longganisa which will fry the longganisa by itself. I used pinakurat vinegar since I forgot to buy the Sukang Iloko. You can also use plain white vinegar but it would probably taste less flavorful. Simply use the dark soy sauce instead of the light soy sauce since our locals use it. To balance everything, I added just a little bit of brown sugar. Believe me you could hardly taste any sweetness. Combine everything in a mixing bowl and let it rest in the fridge for 4 hours or overnight to develop its flavor. Put the mixture into the hog casing using a sausage stuffer and divide according to desired length. Generously prick the longganisa to release some trapped air. This will help to avoid bursting while cooking. Refrigerate for another 3 days before cooking. To cook, place the longganisa de recado in a pan and add 1/4 cup water. Let it simmer until the fat oozed out of the longganisa. Let the longganisa de recado cooked in its own fat until golden brown. Longganisa is a Filipino sausage usually encased in dried or fresh hog casing. It can be garlicky or sweet. Longganisa de Recado is the garlicky version of longganisa. It’s savory and more pungent. Dipping sauce of spicy garlic vinegar and chopped fresh tomatoes will surely complete your meal.